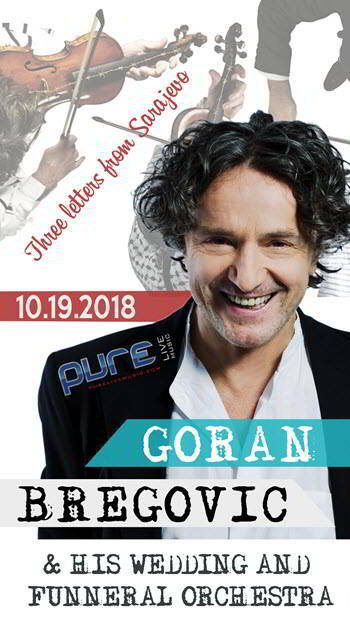 Join us for an unforgettable evening with Goran Bregovic performing songs from his new album “Three Letters From Sarajevo” along with many of his classic, high energy, Balkan brass hits! In its history, Bosnia has been part of many empires: Roman, Byzantine, Ottoman, Austro-Hungarian…. each has left its imprint and its religion – Catholic, Orthodox, Islam and Sephardic Jews, expelled from Spain, arrive in the 16th century. Sarajevo becomes the city of four religions, ‘Jerusalem of the Balkans’, and a metaphor for a peaceful cohabitation and also the horror of hate. Bregović’s new work ” Three Letters from Sarajevo ” is inspired by the complexities of the peoples and history of Sarajevo, the city of different religions, known as ‘Jerusalem of the Balkans’. He explores and celebrates it in this unique piece written for a solo instrument, the violin, that – played in Western, Eastern and Klezmer way – unites on the allegorical level, the three religions that are the biggest treasure and curse of Sarajevo.